Connectors and crimp connectors are used to join cables to other components of Wilson amplifier systems. Connectors come in either male or female variety. A male connector is required to attach into a female connector of the same type. Connector types include Connector types include N, F, FME, SMA, as well as Mini UHF, TNC and MCX connectors. Generally, WILSON400 cables have N-Male connectors; RG-6 cables have F-Male connectors while RG-58 and RG-174 cables utilize a mix of FME and SMA connectors. Crimp connectors require manual attachment onto a custom cut compatible cable, which is recommended for custom installations by expert users. Barrel connectors are used to join two same-type cables together. 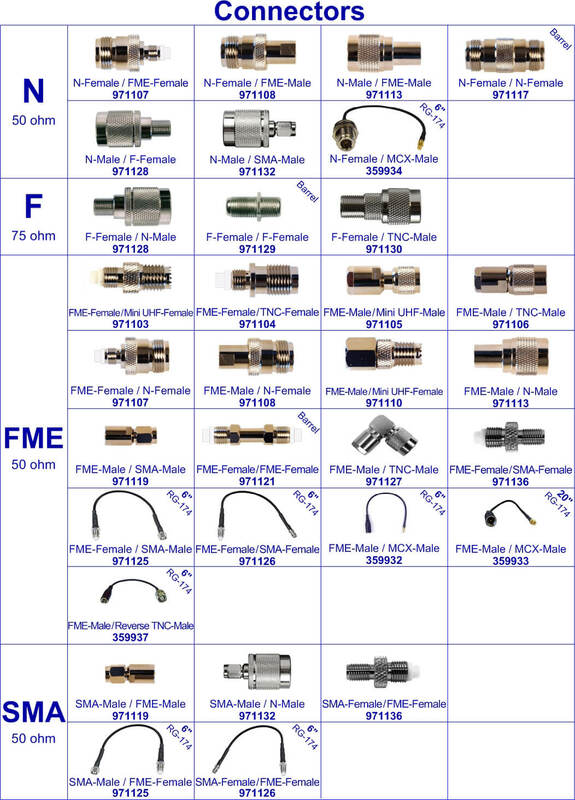 Connectors include N-Female/N-Female barrel (971117), F-Female/F-Female barrel (971129) and FME-Female/FME-Female barrel (971121). Along with N-Female/FME-Female (971107), N-Female/FME-Male (971108), N-Male/FME-Male (971113), N-Male/F-Female (971128), N-Male/SMA-Male (971132), N-Female/MCX-Male with 6 inch RG-174 cable (359934), F-Female/TNC-Male (971130), FME-Female/Mini UHF-Female (971103), FME-Female/TNC-Female (971104), FME-Male/Mini UHF-Male (971105), FME-Male/TNC-Male (971106), FME-Male/Mini UHF-Male (971110), FME-Male/SMA-Male (971119), curved FME-Male/TNC-Male (971127), FME-Female/SMA-Female (971136), FME-Female/SMA-Male with 6 inch RG-174 cable (971119), FME-Female/SMA-Female with 6 inch RG-174 cable (971126), FME-Male/MCX-Male with 6 inch RG-174 cable (359932), FME-Male/MCX-Male with 20 inch RG-174 cable (359933) and FME-Male/Reverse TNC-Male (359937). 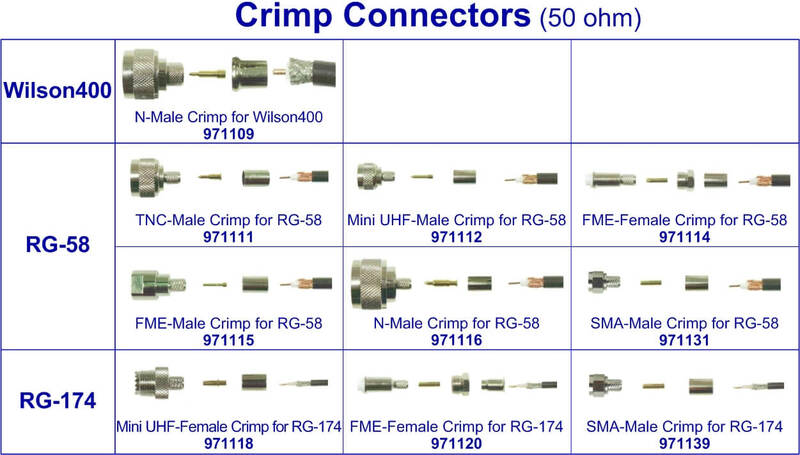 Crimps include an N-Male crimp for Wilson400 cables (971109), a TNC-Male crimp for RG-58 cables (971111), a Mini UHF-Male crimp for RG-58 cables (971112), FME-Female crimp for RG-58 cables (971114), FME-Male crimp for RG-58 cables (971115), N-Male crimp for RG-58 cables (971116), SMA-Male crimp for RG-58 cables (971131), Mini UHF-Female crimp for RG-174 cables (971118), FME-Female crimp for RG-174 cables (971120) and SMA-Male crimp for RG-174 cables (971139).